Detroit Electric (1907–1939) was an American automobilebrand produced by theAnderson Electric Car Company in Detroit, Michigan. Anderson had previously been known as the Anderson Carriage Company (until 1911), producing carriages and buggies since 1884. 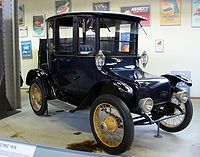 Production of the electric automobile, powered by a rechargeable lead acid battery, began in 1907. For an additional $600.00, an Edison nickel-iron battery was available from 1911 to 1916. The cars were advertised as reliably getting 80 miles (130 km) between battery recharging, although in one test a Detroit Electric ran 211.3 miles (340.1 km) on a single charge. Top speed was only about 20 miles per hour (32 km/h), but this was considered adequate for driving within city or town limits at the time. 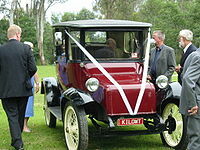 The company production was at its peak in the 1910s selling around 1000 to 2000 cars a year. Towards the end of the decade the Electric was helped by the high price of gasoline duringWorld War I. In 1920 the name of the Anderson company was changed to “The Detroit Electric Car Company” as the car maker separated from the body business (it became part of Murray Body) and the motor/controller business (Elwell-Parker). 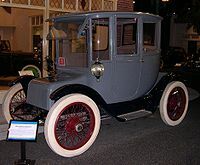 As improved internal combustion engine automobiles became more common and inexpensive, sales of the Electric dropped in the 1920s, but the company stayed in business producing Detroit Electrics until after the stock market crash of 1929. The company filed for bankruptcy, but was acquired and kept in business on a more limited scale for some years, building cars in response to special orders. The last Detroit Electric was shipped on February 23, 1939,(though they were still available until 1942),, but in its final years the cars were manufactured only in very small numbers. Notable people who owned Detroit Electrics cars included Thomas Edison, Charles Proteus Steinmetz,Mamie Eisenhower, and John D. Rockefeller, Jr. who had a pair of Model 46 roadsters. Clara Ford, the wife of Henry Ford, drove Detroit Electrics from 1908, when Henry bought her a Model C coupe with a special child seat, through the late teens. Her third car was a 1914 Model 47 brougham. Detroit Electrics can be seen in various automobile museums. For example, in the Belgian AutoWorld Museum in Brussels, and in Altlußheim, Germany. A beautifully restored and operational Detroit Electric, owned by Union College, is located in the Edison Tech Center in Schenectady, NY. Detroit Electric was an early 20th century electric car, “perhaps the most popular in history,” according to Albert Lam, Chairman and CEO. The Anderson Electric Car Company started building cars under the Detroit Electric brand over 100 years ago. In a joint announcement, the US electric car pioneer and Chinese Youngman Automotive Group announced that they would revive the 100 year-old electric car brand Detroit Electric for an automotive joint venture to bring new vehicle technologies to market. In August 2008, led by Chairman and CEP Albert Lam, a management buy-out of Detroit Electric was completed, ending the involvement of ZAP and China Youngman Automobile Group. In the agreement, ZAP and China Youngman Automobile Group agreed to sell its ownership rights in Detroit Electric for $750,000, the amount it had originally invested. According to an SEC filing, the Detroit Electric joint venture, named after America’s oldest and longest-running electric car company, was launched in September 2007 with Youngman. Originally called EV Holdings Ltd. and incorporated in Hong Kong, the venture was renamed Detroit Electric early this year. ZAP and Youngman had originally agreed to invest a total of $100 million in the venture, but the companies quickly agreed to revise that to just $5 million, $2.5 million each. However, even that truncated investment was never made, and both ZAP and Youngman were unsuccessful in securing outside financing to help float the nascent Detroit Electric, according to the SEC filing. Detroit Electric recently announced a working agreement with Proton Holdings in Malaysia. Under the agreement, Detroit Electric will license two Proton vehicle platforms and contract the company to assemble the electric vehicles that will be marketed under Detroit Electric’s brand. This agreement will provide Detroit Electric with its first manufacturing base.